New! Version 4.1 compatible with Windows 10! Information Anywhere! InteractX 4.1 leverages your investment in machine level HMIs to make development of Supervisory applications faster and easier. InteractX 4.1 can connect directly to Interact Xpress screens and data, allowing you to re-use your machine level application elements at the Supervisory level. This can save up to 80% of Supervisory application development time. Version 4.1 adds the industry’s easiest trending ever � simply point and click and you are logging! 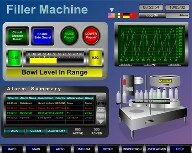 Faster and Easier to Development than any other SCADA package! Includes 60+ communication drivers at no extra charge!